Even When I Fall, a feature documentary by Kate McLarnon and Sky Neal, caught my eye at Sheffield Doc/Fest last year as it boasts not only two women co-directors but also a woman producer (Elhum Shakerifar) and editor (Alice Powell). The film traces the journey of Saraswoti and Sheetal, two trafficking survivors who were sold as child slaves to work in Indian circuses. Now freed, they reclaim skills that once came at a high cost: together with 11 other survivors, they form Circus Kathmandu, Nepal’s first and only circus. This intimate, beautiful film shows them over the course of six years as they confront the families that sold them and seek acceptance within their own country. Strikingly, the young people here are shown as strong and gifted agents who take pride in their art. Rather than erasing their circus past as shameful, they use it to build a bright future for themselves, forming a vibrant community. The documentary is touring the UK at the moment and, following a preview at London BFI Southbank in London on 4 April, it will be released in selected cinemas in the week of 13 April. Kate McLarnon answers a few questions for The F-Word’s readers via email. How did you get access to Circus Kathmandu’s performers? Was it difficult to earn their trust? When my co-director Sky [Neal] was working as a documentary director in 2010, she had already had a career as an aerial performer on silks and trapeze, running her own circus events company in the UK (with Even When I Fall/Circus Kathmandu collaborator Robyn Simpson). After hearing about the trafficking of children to corrupt Indian circuses, she flew out to Kathmandu, originally to work as a consultant for a charity rescuing trafficked minors and giving them refuge, Esther Benjamin’s Trust (founded by Philip Holmes who now runs charity ChoraChori). They had begun to work creatively with the young circus returnees, using arts as therapeutic practice and play, and they were interested in exploring performing arts and social circus as a form of rehabilitation. Sky went out to help to develop this programme. With permission, she took a camera to help document the process and cautiously began to film. Some of these young people (uneducated and often from extremely deprived backgrounds) had incredible circus skills, hard won through a childhood spent in enforced training. For some – not all – as well as a hangover from their indentured service, circus was also something they could enjoy and excel in. Stigmatising these young people,particularly women, on their return, Nepalese society took a pretty dim view of the circus arts. When Sky talked to these girls and told them: “I’m a circus girl, too”, a bond of trust and conversation was opened up, one which was to continue and grow for the next eight years. Gradually, they began to explore a different experience with circus and performance. Collaborating with us and others, they also began to explore ways to tell their own stories. Even When I Fall is a part of that journey. In Nepal in 2010, Sky heard a rescue party was setting out to India and the charity agreed to take her and her camera along with them. She was there for the rescue of Saraswati – a young mother of three who had been in the circus since childhood and married as a girl to the circus owner’s son. Saraswati became a main character in the film and today she stands up as an outspoken advocate against child trafficking and for education of girls and other survivors. How long was the journey from initial idea for the film and the final cut? What was most challenging in this process? Making a documentary can be a sprawling process – and ours certainly was. Started in 2010, final cut was completed in 2017. There were a lot of reasons for this length of time, including the balance of life and bill paying in making a film that was for a long time sparsely funded, or not at all. We were often heading out with no money behind us, and hurrying back to work on other stuff to pay the bills, coming back with huge amounts of footage that we couldn’t afford to get translated in the edit room. We had to be patient and tenacious and also had to contend with births (both me and Sky have had babies during the making of the film), deaths and divorces as our own lives carried on concurrently with the lives of our Nepali collaborators and characters. It can be a frustrating process, and we were given a huge boost when Elhum [Shakerifar] joined our team as producer and worked her magic – also giving us strength with the way she really ‘got’ the story we were trying to tell and why it was important, especially in its strong and central female characters. But one of the most satisfying reflections we can make now is that the drawn out process of filming has meant we were able to tell a story of real change and growth. We met Sheetal – another main character – as a girl who didn’t know her age or real name, and who struggled to express herself, finding her feet in a very new freedom. When the film leaves her, she has matured into a strong, proud young woman who can stand on a stage and speak from the heart, captivating crowds. It has been quite something to be able to bear witness to that period of someone’s life. You say you want your film to “do more than just tell an incredible story”. Can you tell us what outreach events have happened so far and what are planned? 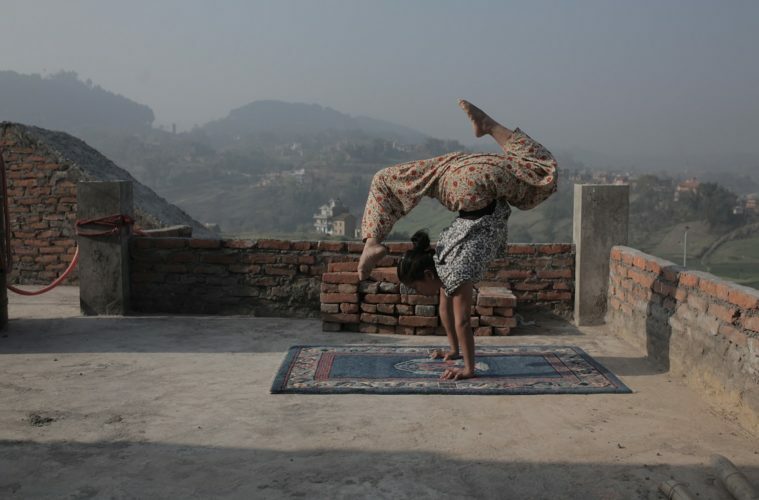 Circus Kathmandu are using their work to educate across Nepal – travelling to trafficking-prone communities and talking to vulnerable young people and parents about the risks and realities of rife bonded labour and human trafficking. One of the most dangerous aspects of the trafficking problem is how it hides in plain sight, offering families a way out of poverty that deliberately masks and missells the realities of what occurs. We made the film always with the hope that it could contribute something tangible to this work. We have already screened the film several times in Nepal and Circus Kathmandu has now been awarded a grant by Comic Relief to [help] use the film in their work. In collaboration with an ethical recruitment agency, they will be screening it as a tool to help create a shared experience with audiences across Nepal – workshopping questions and issues thrown up by the realities portrayed. For years now Circus Kathmandu members have been using their own life stories woven into their circus acts and this now adds another layer to a sophisticated and really powerful means of using reality to fire imagination and education. We hope this role for the film will only grow – with use in schools and educational settings in the region, in the UK and worldwide. What is the main message you want the UK audience to leave the screening with? I think we quietly touch on a lot of issues in this film which we have never seen as an opinion piece or a soapbox doc. Our aim was to portray a seriously complex reality through the eyes and words of some of its witnesses. So the issues and the answers aren’t in headlines and nor are they straightforward. Trafficking is often portrayed in black and white strokes in western media, with its horror stories graphically focused on. We wanted to focus instead on a lesser told story – the experience of life after rescue. We saw some of the challenges faced by the lucky ones and all the collateral damage revealed by their attempt to move on with their lives. For example, we felt we had to try to show something of the experience of mothers, forced by circumstance or family to send their children away and often deceived by traffickers as to what that really means. Confronted by those same children returning as young adults with experiences of abuse and hardship, it’s hard to imagine what their feelings must be. But as well as looking harder at the entrenched reality of trafficking and its repercussions, beyond anything else we see this film as a universal story of survival and change, of renewal and ownership. The women in Even When I Fall have taken their past in their own hands and are conquering it in their own beautiful way. Owning their stories and their skills, they are moving up and out of a life dictated to them by circumstance and damage, and are giving hope to thousands of women like them through their work. Hopefully the film can keep spreading that great work of change even farther afield and bolster the same bravery in anyone striving to shake off shadows of their own past. Check the website for screening dates and places. Editor’s note: Esther Benjamin’s Trust mentioned in the article is now called Child Rescue Nepal. All images courtesy of Even When I Fall. 1. A young brown skinned woman, with her black hair in a bun on top of her head, is performing a headstand with her legs stretched like in splits. She’s wearing a patterned short sleeved top and patterned long loose-fitting trousers. She’s on a stone terrace or roof, with foggy mountain landscape in the background. 2. Between the buildings in a Nepalese city (there’s lettering in Ranjana script on the wall), a person with long hair is hovering in the air above a group of people standing on the ground, their arms extended to catch the person when they fall down. 3. Two brown-skinned women wearing black T-shirts with Circus Kathmandu logo are rehearsing or performing, with one of them about to spin the other. There are musicians in the background and what looks like two audience members.